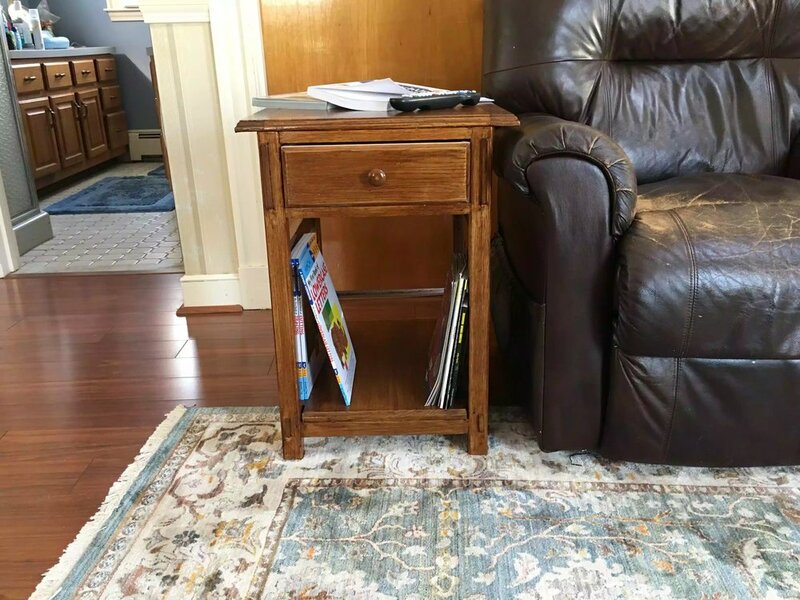 I was sitting at in one of my arm chairs in my living room drinking my morning cup of coffee and got tired of reaching for my cup of joe as there was no table near me, so I saw a project on Pinterest that basically made a table to fit around the arm of the chair and thought this was a great little project to use up some scraps and remedy my little problem. 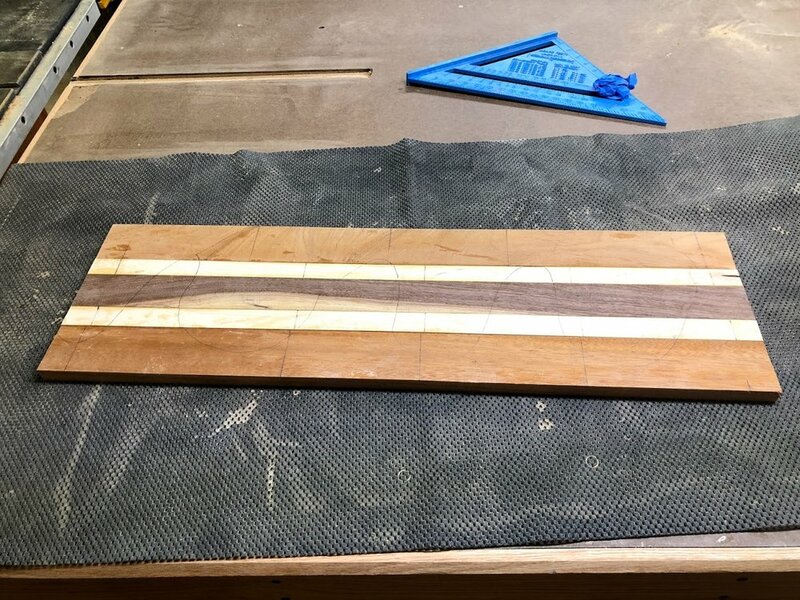 I recently had been given a bunch of scrap wood that varied in species and board size, I decided that this project would be perfect for making the sleeve. I used 3 species of wood of vary widths to make up the 9” width that I used looking for. So I used Walnut, Maple and Cherry to make up the panel I wanted. I used my pipe clamps and a few cauls in gluing up this panel, I left it overnight to set up. So now that I have a nice flat panel next on the list was to cut the miters on the two mating ends of the panel. I did some research online on how to do this and also achieve the effect of wrapping the grain around the entire piece so I needed to cut the panels in sequence. I found a very useful YouTube video in doing this and I have placed a video below in how to achieve it. Now that I had my 3 mitered panels to form the 3 sides of the sleeve, I decided to add some decorative and visual interest to the panel, I decided to add rounded edges to the bottom of the side panels, to do that I used my circle template guide to mark round-overs with a 3/4” radius and then I used my jigsaw to cut the rounded edges off and then to finish up the process I took the 2 panels to the spindle sander to smooth the edges and remove the milling marks left from the jigsaw. Unfortunately I lost the picture I took of this process but below you can see the finished edges. I spent another month or so finalizing the dimensions for the table in Sketchup and ultimately made a set of plans in Layout, that I am selling in my Etsy shop. I have to say that the project was very tough for me because it was my first time doing a lot of the features such as through mortise and tenon joinery, and machine cut half blind -dovetails. I t was also my first doing breadboard ends. 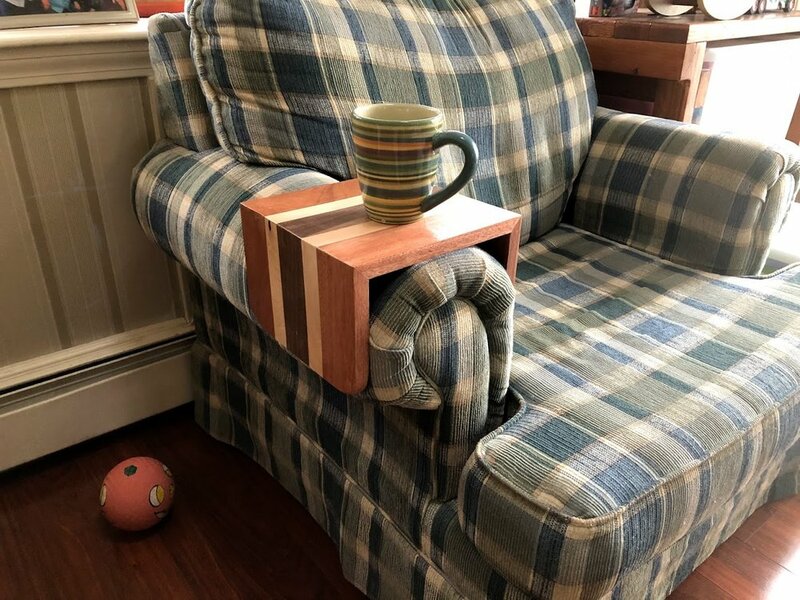 But that’s what I wanted a piece of furniture that I never made before using woodworking techniques I’ve never utilized until now. 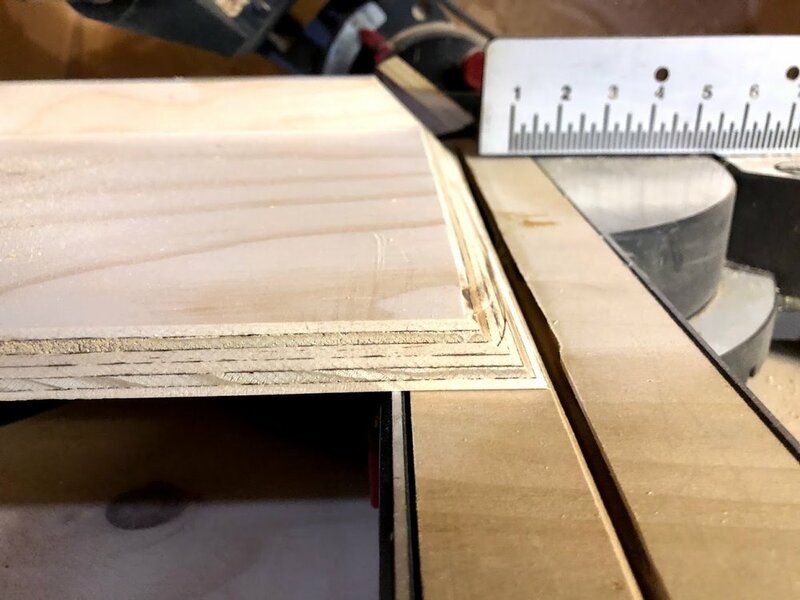 I have to say that one of the toughest jobs was making the through mortise, I used the drill press with a forstner bit and the bit kept wandering which wasn’t exactly giving perfectly parallel mortise walls to the face. I might try the router jig next time. I used my trust dado stack and left the tenon oversize so as that I could fine tune the tenon thick and length, using a sacrificial fence on my miter gauge prevented tear-out and I also used painters tape to back the cut up, since these were through tenon’s I needed them to be clean and crisp so this took a lot of time. The 4 legs are all joined with upper aprons which the table-top sat on, these aprons were through mortise and tenon joinery on the sides but the back apron was a traditional mortise and tenon that didn’t come through the back legs as the side aprons did, figuring out the dimensions for back apron was very tedious because the tenons had to miss each other so as that the frame could be all joined together. That completed the upper part of the frame, I also did through M&T on the lower shelf rails this wasn’t as big a through M&T but I secured the lower rails and these rails received mortises so as that the spindles could be secured with traditional M&T. The table top was made of 3 (1×8) solid oak boards that I just glued up, I didn’t use any biscuits or joinery but I did use a new approach when to sand the panel, I waited about 30 minutes for the glue to set up and then I used a scraper to remove the glue, I was so tired of applying stain and them annoying white blotches on the wood, so I did it this way and it came out perfect as you can see. Sorry to say that I am not sure where all the pictures went for the breadboard ends but needless to say I think it came out ok. I cut a recessed tenon on the left and right side of the panel, I cut about 1: away from each end so as to hide the end grain, I also used dowels to reinforce the breadboard groove that fit the tenon and to also allow for seasonal wood movement especially the center panel in the table top I am happy with the outcome. To finish the table top I applied 3 coats of poly-stain and then an additional 2 coats of Poly Acrylic making it resist all the hot cups that will be placed on it. All in all the project was a success and my wife and mother in-law love it, Thanks for looking!!! My wife said that I need you make something for all our 5 year old sons toys (and so the honey-do-list ) just became longer. So off I went to search the internet for some inspration and I came across this plastic tote storage option made out of 2×4s. I have plans available, please click the link below this projects. 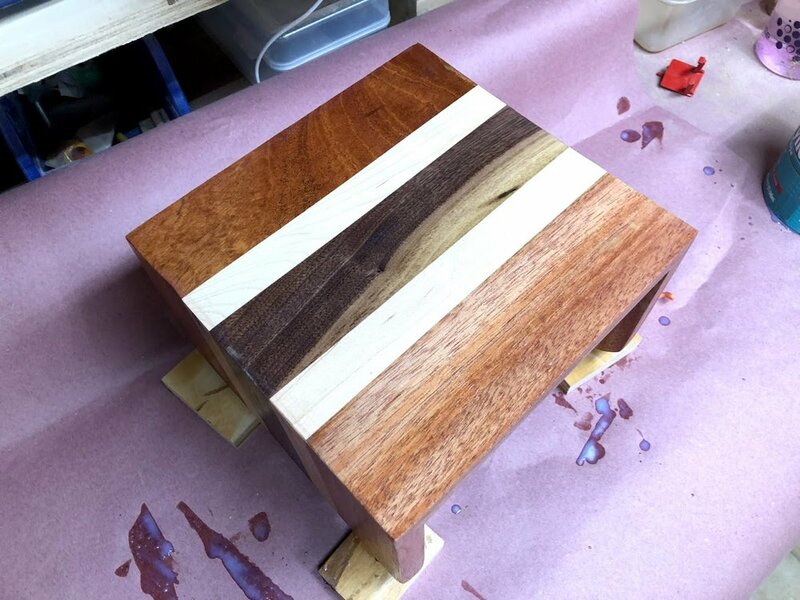 I think the end result is awesome and can be applied in so many ways, you can dress it up with stain and router profiles on to it, or it can totally utilitarian and used in your shop.